El programa de formación de profesores en la enseñanza en línea del griego que fue desarrollado como parte del proyecto GLOSSA 2 ha recibido la acreditación oficial por parte de la CPI Organización Internacional - Asociación Internacional de Idiomas. Como resultado de esta acreditación, los profesores de idiomas que están participando (y participarán en las ediciones futuras) en el seminario en línea que está organizado por el Centro de Cultura Helénica y Acción Sinergia podrán recibir la acreditación oficial por parte de esta organización internacional. 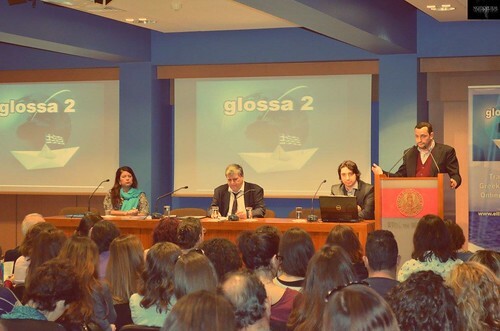 La conferencia final del proyecto GLOSSA 2 se llevó a cabo este mes de noviembre (14/11/2015). Todo el evento fue transmitido en vivo y se puede ver de nuevo. Haga clic en la foto para verlas en la galería del evento! Welcome to the GLOSSA 2 electronic platform! Here you could attend free online Greek language courses in B1 level during the pilot- research phase of our project (Beginning of February – beginning of July 2015) and you could have access for one more month after the end of the course, so that you can do some more activities, if you want, on the platform. The course consists of synchronous (once / week/ one hour) and asynchronous meetings with the teachers. In order to subscribe for the course, please do the written test here. This test is self- corrected, so you can have instant feedback. Apart from that, in order to subscribe to the free online course, we need you to send us a recorded file, answering the questions that you will find here. You are kindly requested not to write the answers to the questions, but to read them, think of the answers and record your voice here. We invite you to send the audio test recording your voice TOO, even if the written test has given you a low grade. Your teachers will judge whether you are in the right level of Greek to attend this course. You will soon be informed from our side about your inscription to this course. We remain available for any further questions.